The Marxian doctrine of the alleged arbitrary power of employers over wages appears plausible because there are two obvious facts that it relies on, facts which do not actually support it, but which appear to support it. These facts can be described as “worker need” and “employer greed.” The average worker must work in order to live, and he must find work fairly quickly, because his savings cannot sustain him for long. And if necessary—if he had no alternative—he would be willing to work for as little as minimum physical subsistence. At the same time, self-interest makes employers, like any other buyers, prefer to pay less rather than more—to pay lower wages rather than higher wages. People put these two facts together and conclude that if employers were free, wages would be driven down by the force of the employers’ self-interest—as though by a giant plunger pushing down in an empty cylinder—and that no resistance to the fall in wages would be encountered until the point of minimum subsistence was reached. At that point, it is held, workers would refuse to work because starvation without the strain of labor would be preferable to starvation with the strain of labor. What must be realized is that while it is true that workers would be willing to work for minimum subsistence if necessary, and that self-interest makes employers prefer to pay less rather than more, both of these facts are irrelevant to the wages the workers actually have to accept in the labor market. Let us start with “worker need.” To understand why a worker’s willingness to work for subsistence if necessary is irrelevant to the wages he actually has to work for, consider the analogous case of the owner of a late-model car who decides to accept a job offer, and to live, in the heart of New York City. If this car owner cannot afford several hundred dollars a month to pay the cost of keeping his car in a garage, and if he cannot devote several prime working hours every week to driving around, hunting for places to park his car on the street, he will be willing, if he can find no better offer, to give his car away for free—indeed, to pay someone to come and take it off his hands. Yet the fact that he is willing to do this is absolutely irrelevant to the price he actually must accept for his car. That price is determined on the basis of the utility and scarcity of used cars—by the demand for and supply of such cars. Indeed, so long as the number of used cars offered for sale remained the same, and the demand for used cars remained the same, it would not matter even if every seller of such a car were willing to give his car away for free, or willing even to pay to have it taken off his hands. None of them would have to accept a zero or negative price or any price that is significantly different from the price he presently can receive. This point is illustrated in terms of the simple supply and demand diagram presented in Figure 14–1. On the vertical axis, I depict the price of used cars, designated by P. On the horizontal axis, I depict the quantity of used cars, designated by Q, that sellers are prepared to sell and the buyers to buy at any given price. The willingness of sellers to sell some definite, given quantity of used cars at any price from zero on up (or, indeed, from less than zero by the cost of having the cars taken off their hands) is depicted by a vertical line drawn through that quantity. That vertical line, labeled SS, denotes the fact that sellers are willing to sell the specific quantity A of used cars at any price from something less than zero on up to as much as they can get for their cars. The fact that they are willing to sell for zero or a negative price has nothing whatever to do with the actual price they receive, which in this case is the very positive price P1. The actual price they receive in this case is determined by the limitation of the supply of used cars, together with the demand for used cars. Essentially the same diagram, Figure 14–2, depicts the case of labor. 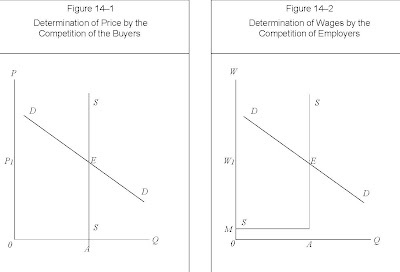 Instead of showing price on the vertical axis, I show wages, designated by W. Instead of the supply line being vertical to the point of the sellers being willing to pay to have their good taken off their hands, I assume that no supply whatever is offered below the point of “minimum subsistence,” M. This is depicted by a horizontal line drawn from M and parallel to the horizontal axis. Thus, the supply curve in this case has a horizontal portion at “minimum subsistence” before becoming vertical. These are the only differences between Figures 14–1 and 14–2. It also quickly becomes clear that “employer greed” is fully as irrelevant to the determination of wage rates as “worker need.” This becomes apparent as soon as one thinks in terms of the conditions of an auction. The competition of two or more bidders at an auction brings out the essential nature of the market for labor and clearly demonstrates the actual nature of the self-interest of buyers. Thus, assume that there are two people at an art auction, both of whom want the same painting. One of these people, let us call him Mr. Smith, is willing and able to bid as high as $2,000 for the painting. The other, let us call him Mr. Jones, is willing and able to go no higher than $1,000. Of course, Mr. Smith does not want to spend $2,000 for the painting. This figure is merely the limit of how high he will go if he has to. He would much prefer to obtain the painting for only $200, or better still, for only $20, or, best of all, for nothing at all. What we must understand here is precisely how low a bid Mr. Smith’s rational self-interest allows him to persist in. Would it, for example, actually be to Mr. Smith’s self-interest to persist in a bid of only $20, or $200? It should be obvious that the answer to this question is decidedly no! This is because if Mr. Smith persists in such a low bid, the effect will be that he loses the painting to Mr. Jones, who is willing and able to bid more than $20 and more than $200. In fact, in the conditions of this case, Mr. Smith must lose the painting to the higher bidding of Mr. Jones, if he persists in bidding any sum under $1,000! If Mr. Smith is to obtain the painting, the conditions of the case require him to bid more than $1,000, because that is the sum required to exceed the maximum potential bid of Mr. Jones. This case contains the fundamental principle that names the actual self-interest of buyers. That principle is that a buyer rationally desires to pay not the lowest price he can imagine or would like to pay, but the lowest price that is simultaneously too high for any other potential buyer of the good, who would otherwise obtain the good in his place. This identical principle, of course, applies to the determination of wage rates. The only difference between the labor market and the auction of a painting is the number of units involved. Instead of one painting with two potential buyers for it, there are many millions of workers who must sell their services, together with potential employers of all those workers and of untold millions more workers. This is because just as in the example of the art auction, the essential fact that is present in the labor market is that the potential quantity demanded exceeds the supply available. The potential quantity of labor demanded always far exceeds the quantity of labor that the workers are able, let alone willing, to perform. At the same time, for all practical purposes there is no limit to our need and desire for goods or, therefore, for the performance of the labor required to produce them. In having, for example, a need and desire to be able to spend incomes five or ten times the incomes we presently spend, we have an implicit need and desire for the performance of five or ten times the labor we presently perform, for that is what would be required in the present state of technology and the productivity of labor to supply us with such increases in the supply of goods. Moreover, almost all of us would welcome the full-time personal services of at least several other people. Thus, on both grounds labor is scarce. For the maximum amount of labor available to satisfy the needs and desires of the average member of the economic system can never exceed the labor of just one person. One person is the number that always results when we divide one and the same number of people in their capacity as consumers by that number of people in their capacity as potential producers. Indeed, in actual practice, the amount of labor available per person falls far short of the labor of one person, because of the existence of large numbers of people, notably young children and the elderly, who are incapable of performing labor and must live as dependents on the labor of others. The consequence of the scarcity of labor is that wage rates in a free market can fall no lower than corresponds to the point of full employment. At that point the scarcity of labor is felt, and any further fall in wage rates would be against the self-interests of employers, because then a labor shortage would ensue. Thus, if somehow wage rates did fall below the point corresponding to full employment, it would be to the self-interest of employers to bid them back up again. These facts can be shown in the same supply and demand diagram I used to show the irrelevance to wage determination of workers being willing to work for subsistence. 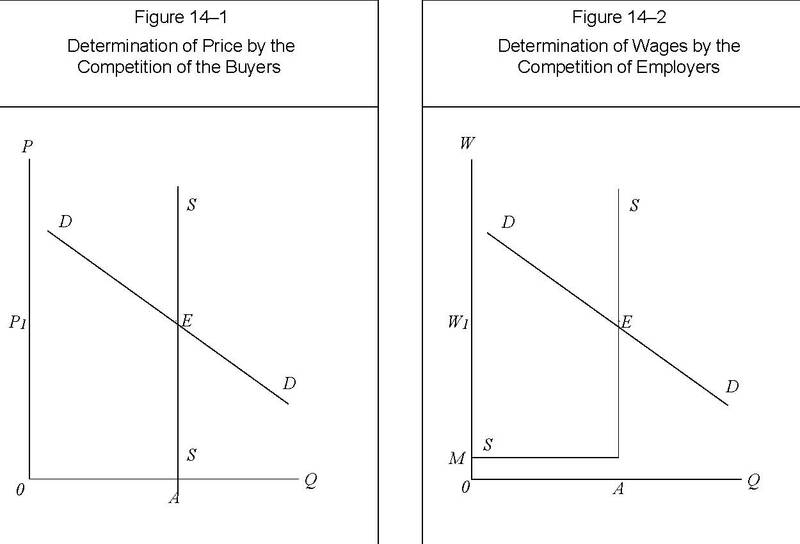 Thus, Figure 14–3 shows that if wage rates were below their market equilibrium of W1, which takes place at the point of full employment, denoted by E—if, for example, they were at the lower level of W2—a labor shortage would exist. 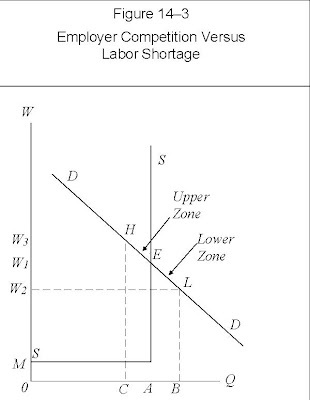 The quantity of labor demanded at the wage rate of W2 is B. But the quantity of labor available—whose employment constitutes full employment—is the smaller amount A. Thus, at the lower wage, the quantity of labor demanded exceeds the supply available by the horizontal distance AB. The shortage exists because the lower wage of W2 enables employers to afford labor who would not have been able to afford it at the wage of W1, or it enables employers who would have been able to afford some labor at the wage of W1 to now afford a larger quantity of labor. To whatever extent such employers employ labor that they otherwise could not have employed, that much less labor remains to be employed by other employers, who are willing and able to pay the higher wage of W1. At the artificially low wage of W2, the entire quantity AB of labor is employed by employers who otherwise could not have afforded to employ that labor. The effect of this is to leave an equivalently reduced quantity of labor available for those employers who could have afforded the market wage of W1. The labor available to those employers is reduced by AC, which is precisely equal to AB. This is the inescapable result of the existence of a given quantity of labor and some of it being taken off the market by some employers at the expense of other employers. What the one set gains, the other must lose. Thus, because the wage is W2 rather than W1, the employers who could have afforded the market wage of W1 and obtained the full quantity of labor A are now able to employ only the smaller quantity of labor C, because labor has been taken off the market by employers who depend on the artificially low wage of W2. The employers who could have afforded the market wage of W1 are in identically the same position as the bidder at the art auction who is about to see the painting he wants go to another bidder not able or willing to pay as much. The way to think of the situation is that there are two groups of bidders for quantity AB of labor: those willing and able to pay the market wage of W1, or an even higher wage—one as high as W3—and those willing and able to pay only a wage that is below W1—a wage that must be as low as W2. 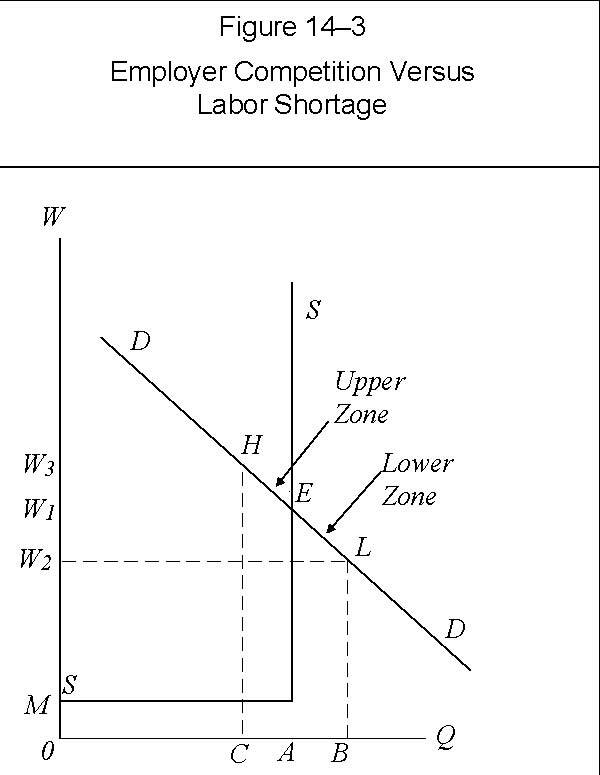 In Figure 14–3, the position of these two groups is indicated by two zones on the demand curve: an upper zone HE and a lower zone EL. The wage of W1 is required for the employers in the upper zone to be able to outbid the employers in the lower zone. The question is: Is it to the rational self-interest of the employers willing and able to pay a wage of W1, or higher, to lose the labor they want to other employers not able or willing to pay a wage as high as W1? The obvious answer is no. And the consequence is that if, somehow, the wage were to fall below W1, the self-interest of employers who are willing and able to pay W1 or more, and who stood to lose some of their workers if they did not do so, would lead them to bid wage rates back up to W1. The rational self-interest of employers, like the rational self-interest of any other buyers, does not lead them to pay the lowest wage (price) they can imagine, but the lowest wage that is simultaneously too high for other potential employers of the same labor who are not able or willing to pay as much and who would otherwise be enabled to employ that labor in their place. The principle that it is against the self-interest of employers to allow wage rates to fall to the point of creating a labor shortage is illustrated by the conditions which prevail when the government imposes such a shortage by virtue of a policy of price and wage controls. In such conditions, employers actually conspire with the wage earners to evade the controls and to raise wage rates. They do so by such means as awarding artificial promotions, which allow them to pay higher wages within the framework of the wage controls. The payment of higher wages in the face of a labor shortage is to the self-interest of employers because it is the necessary means of gaining and keeping the labor they want to employ. In overbidding the competition of other potential employers for labor, it attracts workers to come to work for them and it removes any incentive for their present workers to leave their employ. This is because it eliminates the artificial demand for labor by the employers who depend on a below-market wage in order to be able to afford labor. It is, as I say, identically the same in principle as the bidder who wants the painting at an auction raising his bid to prevent the loss of the painting to another bidder not able or willing to pay as much. The higher bid is to his self-interest because it knocks out the competition. In the conditions of a labor shortage, which necessarily materializes if wage rates go below the point corresponding to full employment, the payment of higher wages provides exactly the same benefit to employers. On the basis of the preceding discussion, it should be clear that average money wage rates are determined neither by worker need nor by employer greed, but, basically, by the quantity of money in the economic system and thus the aggregate monetary demand for labor, on the one side, and by the number of workers willing and able to work, on the other—that is, by the ratio of the demand for labor to the supply of labor. It should also be clear that in a free labor market, money wage rates can fall no lower than corresponds to the point of full employment. Two points should be realized in connection with the principle that it is against the self-interest of employers to allow wage rates to fall below the point that corresponds to full employment. First, the operation of the principle does not require that full employment be established throughout the economic system before wage rates cease to fall. On the contrary, the principle applies to each occupation and, still more narrowly, to each occupation within each geographical area. For example, the wage rates of carpenters in Des Moines can fall no further than corresponds to the point of full employment of carpenters in Des Moines. Any further fall would create a shortage of such carpenters and thus would be prevented or quickly reversed, even though there might still be major unemployment in other occupations or in other geographical areas. Second, the operation of the principle need not be feared as possibly serving to bring about the establishment of subsistence wages through the back door, so to speak. By this, I mean that so long as unemployment exists, there is room for wage rates to fall without the creation of a labor shortage. And in a free market, wage rates would in fact fall in such circumstances. This is because in such circumstances, the self-interest of the employers, and also of the unemployed, would operate to drive them down. It should not be thought, however, that the fall in wage rates in these circumstances meant that the conditions of supply and demand were capable of accomplishing the human misery that Marxism attributes to the alleged arbitrary power of businessmen and capitalists. A drop in wage rates to the full employment point does not imply any drop in the average worker’s standard of living. That is, it does not imply any reduction in the goods and services he can actually buy—any reduction in his so called real wages—because the elimination of unemployment that the fall in wage rates brings about means more production and a fall in costs of production, both of which mean lower prices. Indeed, it is likely that real wages actually rise with the elimination of unemployment, even in the short run, because not only do prices fall as much as, or even more than, wages, but also the burden of supporting the unemployed is eliminated, with the result that disposable, take-home pay drops less than gross wages and less than prices. When these facts are kept in mind, it is clear that insofar as market conditions require a fall in wage rates, they are, if anything, at the same time operating to raise the average worker’s standard of living further above subsistence, not drive it down toward subsistence. 1. See Eugen von Böhm-Bawerk, Capital and Interest, 3 vols., trans. George D. Huncke and Hans F. Sennholz (South Holland, Ill.: Libertarian Press, 1959), 2:245. See also above, pp. 162–63. At present, the age at which full—“normal”—Social Security benefits can be obtained, given the individual’s lifetime earnings and contributions to the system up to that time, is 66. This represents an increase of 1 year from the age in force from the system’s inception until 2003, at which time it was increased by 2 months, reaching 66 after a series of 5 more 2-month increases in the years 2004-2008. Commencing in 2021, the full-benefit retirement age is scheduled to begin increasing by a second series of 2-month additions, until a full-benefit retirement age of 67 is reached in 2027. From the beginning of the system, and scheduled to continue indefinitely, it has been possible to choose to receive Social Security benefits starting at age 62, though at a reduced rate. This rate is currently 75 percent of the full-benefit amount, down from 80 percent when the full-benefit retirement age was 65, and is scheduled to fall to 70 percent when the full-benefit retirement age rises to 67. By continuing to work and postponing the receipt of benefits until age 70, it has been possible to obtain premium benefits that are currently, i.e., for retirees in 2011, 32 percent higher than the “full” benefit amount. This premium is scheduled to fall to 24 percent when the full-benefit retirement age rises to 67. The age for enrollment in Medicare is still 65, and, under existing law, is not scheduled to increase. Indeed, enrollment at any later age is frequently penalized. The Social Security system, together with Medicare, could be eliminated by means of the following steps, each one of which would result in substantial cost savings. First, following a grace period of perhaps two or three years, to provide sufficient warning and time to adjust, there should be a phased increase to 70 in the age at which individuals are eligible to receive full Social Security benefits and Medicare. At the same time, the early benefit retirement age for Social Security should be increased from 62 to 66. The increases in age could take place in 6-month increments over a period of 8 years, with the exception of an initial increment of 1½ years in the case of Medicare. Thus, assuming that the reform I’m proposing were implemented prior to 2021, with the Social Security retirement age still at 66, in the first year of its implementation the early Social Security retirement age would be raised to 62½, while the full-benefit retirement age, along with the Medicare retirement age, rose to 66½. In the second year, the respective retirement ages would be 63 and 67. And so it would continue, year after year, for a total increase of 4 years over an 8 year period. In this period, apart from adjustments for increases in the consumer price index, retirement benefits would remain unchanged as the respective ages increased at which they could begin to be obtained. Thus, by the end of the process, individuals receiving early retirement benefits at age 66 would receive no greater benefits than individuals had previously obtained at age 62. In the same way, individuals at age 70would receive full benefits no greater than individuals had received at age 66, before the process of reform began. Thus, when completed, after 8 years, the effect of just this phase of the reform would be a substantial reduction both in the number of people receiving Social Security and Medicare benefits and in the average per capita benefit received by those who remained in the Social Security program. Members of the age group 65-69 would no longer receive Medicare benefits. Members of the age-group 62-65 would no longer receive Social Security at all. Members of the age-group 66-69 enrolled in the program at that time, would receive benefits 25 percent less than their predecessors had received, before the start of the reform, because just as early retirement benefits starting at age 62 had been 25 percent less than the full benefits starting at age 66, so now early retirement benefits starting at age 66 would be 25 percent less than full benefits starting at age 70. Indeed, the reduction in the benefits of the 66-69 age-group would be further increased to the extent that they would no longer contain any premiums for retirement after 66. The elimination of premium benefits would ultimately work to reduce the aggregate benefits of all later age-groups as well, insofar as they too would eventually no longer reflect the incorporation of premium benefits to anyone. As of December 2009, of the approximately 33.5 million people receiving Social Security retirement benefits, approximately 4.4 million, or roughly 13 percent, were in the age-group 62-65. This group received retirement benefits of $54.7 billion, which represents about 11.7 percent of the aggregate Social Security retirement benefits of $468.2 paid in 2009.3 It is not unreasonable to assume that the closing of Social Security to new enrollees in the 62-65 age-group would achieve comparable percentage reductions in the number of people receiving Social Security retirement benefits and in the overall cost of the program. To this must be added the effect of the 25 percent reduction in the benefits of the 66-69 age-group plus the effect of the elimination of premiums for late retirement. Based on the Social Security benefits paid to the members of the 62-65 and 66-69 age-groups in 2009 relative to total Social Security retirement benefits in that year, the resulting overall reduction in the cost of such benefits can be estimated at approximately 18 percent. The benefits paid to the members of the 66-69 age-group were $116.9 billion, representing 25 percent of the total. A 25 percent reduction in these benefits represents a reduction of 6.25 percent in overall benefits. Thus, the total reduction in benefits is the sum of 11.7 percent, the share of Social Security retirement income previously received by the members of the 62-65 age-group, plus 6.25 percent, i.e., approximately 18 percent in all. This percentage is the measure of the reduction in the yearly cost of Social Security that can be expected at the end of 8 years. The second step in the elimination of Social Security would be the elimination of the category of early retirement. This could be accomplished by the early retirement age continuing to increase by a further set of 8 increments of 6-months each, which would bring it to the point of coinciding with the by-then established full-benefit retirement age of 70. Based on the data from 2009, this would result in cutting the cost of Social Security by a further 18.75 percent, raising the total cost saving, at the end of 16 years, to almost 37 percent per year. As compensation for their loss of Social Security and Medicare benefits, individuals in the 66-69 age-group who remained at work, which many of them would now no doubt have to do, would be made exempt from federal income taxes on an amount of income equal at least to the maximum income then subject to the payment of Social Security taxes. (This amount is currently $106,800.) These individuals would also be exempted from the payment of Social Security taxes, including employer contributions on the part of those who were self-employed. The exemptions would be adjusted for increases in the consumer price index and be automatically extended to older ages as the Social Security/Medicare retirement age advanced beyond 70. Indeed, right from the very beginning of the reform, the exemptions would apply to all individuals 66 or older eligible for Social Security retirement benefits who abstained from taking them in any given year. For example, even in the very first year of the reform, someone 75 or 80, who did not accept those benefits in that year, would have these tax exemptions in that year. It should be realized that these federal income tax exemptions would apply to incomes that for the most part would not otherwise have existed, with the result that the government would not incur any significant loss of revenue by offering them. Indeed, the result of millions of people in their sixties remaining in employment and off Social Security and Medicare would not only be a major reduction in government spending for Social Security and Medicare, but also a substantial rise in government tax revenues as well. The rise in tax revenues would come about because people in the 62–69 age bracket, now gainfully employed instead of on Social Security and Medicare, would pay more in the form of sales, excise, and property taxes, as the result of their having and spending higher incomes than they would have received from Social Security. And they would pay more in the form of state and local income taxes as well. For example, instead of someone receiving $10,000 or $20,000 a year in Social Security income, he would earn $20,000 or $30,000 or more in employment income. The federal government would save the $10,000 or $20,000 Social Security expenditure (plus more or less considerable Medicare expenditure), and, in addition, state and local governments would collect significant additional tax revenues out of the expenditure of the newly earned employment incomes. It must be pointed out here that the phaseout of the Social Security and Medicare programs, or the undertaking of any other measure that would be accompanied by an increase in the number of people seeking employment, calls for an intensification of efforts to abolish or restrict as far as possible prounion and minimum-wage legislation. This is necessary in order to make it possible for the larger number of job seekers to find employment. Union pay scales and a government-imposed minimum wage operate to prevent this by arbitrarily and forcibly holding wage rates above free-market rates, thereby holding the quantity of labor demanded below the supply available. The next step in the elimination of Social Security/Medicare would be raising their retirement age beyond 70. This could be accomplished by further incremental annual increases, this time of one calendar quarter with the passage of each year. Thus, by the end of an additional 20 years, the Social Security/Medicare retirement age would be 75. At that point, based on the same data as cited previously, the annual savings in the cost of Social Security retirement benefits would be slightly more than 59 percent, while the annual savings in Medicare expenditures would be almost 31 percent. Raising their retirement age 1 year more, over an additional 4 year period, would bring the total lapse of time from the initial implementation of the phaseout reform to 40 years. Under this arrangement, everyone age 36 and above at the start of the phaseout reform would be able to look forward to enrolling in Social Security and Medicare no later than at age 76, if that is what he wanted. At the same time, if he wished the equivalent of being able to retire at age 70 on a Social Security income, all that would be required of him would be to make provision for a maximum of the 6 years between age 70 and age 76 at a level equal to what he would previously have received under the Social Security Program. Forty years is a sufficient period of time to enable everyone age 35 or below at the time of the initial implementation to make adequate provision for his own retirement at age 70, or even at age 65 if that is what he wanted. At this point then, the Social Security and Medicare programs would be closed to new enrollees. Thereafter, with the passage of each year, the cost of the programs would steadily diminish. Based once more on the same data as referenced previously, after an additional 9 years, by which time the minimum age of those still receiving Social Security and Medicare would be 85, the annual cost of the programs could be expected to be reduced by 88 percent and 66 percent respectively. With the passage of 10 years more, by which time the minimum age of those still receiving benefits was 95, the annual cost of Social Security would be reduced by 99 percent and that of Medicare by a further 16 to 17 percent, for a cumulative reduction of 82 to 83 percent. The complete elimination of Social Security and Medicare would, of course, require the elimination of these aspects of the programs as well. Possible first steps in this direction would be the establishment of means tests for the receipt of such aid along with the return of such programs to the states and localities. These steps could begin early in the phaseout. In addition, the progressive elimination of the Social Security/Medicare system would operate to promote saving and capital accumulation. The saving of individuals would steadily replace taxes as the source of provision for old age. The increased capital accumulation that this made possible would, of course, increase the demand for labor and the productivity of labor, which means that it would increase wage rates and the supply of goods, which latter would operate to reduce prices. Thus, real wages and the general standard of living would rise. The rise would be a continuing one insofar as the rate of capital accumulation was permanently increased as the result of greater saving and a correspondingly greater concentration on the production of capital goods relative to consumers’ goods. At the same time, however, over the course of the many years that would be required for the burden of Social Security/Medicare to reach the vanishing point, all those people thirty-five and below at the time of the start of the phaseout program, and many of their children, would painfully learn the meaning of having to pay off a national debt. For the financial obligations incurred under Social Security and Medicare are in fact an enormous national debt. They are an enormous national debt incurred to elderly and infirm people incapable of caring for themselves. People incapable in large measure simply because they had been promised that the government would care for them and thus that it was not necessary for them to save. Two major lessons to be learned from the financial disaster constituted by Social Security/Medicare are that the government should be prohibited from incurring any significant national debt and that a governmental promise of pensions or provision of future medical care is a category of national debt. All levels of government should be constitutionally prohibited from incurring significant amounts of debt beyond a very short term, including, above all, pension obligations of any kind. Hopefully, there is a special place in Hell reserved for all the political con-men and intellectual shysters of the last generations who endlessly dismissed the significance of national debts with such glib phrases as “we owe it to ourselves” and asserted that national debts need never be paid. These, of course, were the same con-men and shysters who again and again ignorantly denounced saving as cash hoarding and the cause of depressions and mass unemployment. And in the case of all the government officials who over a period of decades and decades knowingly used the proceeds of Social Security taxes to finance current government spending, these con-men and shysters descended to the status of major criminals, guilty of the crime of embezzlement on a scale unprecedented in all of human history. They diverted literally trillions of dollars of what people were led to believe were their savings, set aside for their future benefit, into current government spending. The spending was for projects desired by these officials and designed to keep them in office by fostering the illusion that the officials had performed the miracle of providing seemingly valuable current benefits at no corresponding cost. Of course, the reason for the apparent lack of cost was that the costs were covered by the proceeds of embezzlement. Social Security and Medicare have caused a massive diversion of savings into government consumption not only by diverting the proceeds of Social Security and Medicare taxes into current government spending, but by first, and more fundamentally, undermining one of the most important motivations for private saving and investment, namely, the need to provide for one’s old age. The effect of Social Security and Medicare has been to remove the apparent need for much of that saving. Not surprisingly, in the conviction that the government was now providing for people’s old age, the rate of saving in the United States has declined precipitously over the years, falling all the way to zero in some years. The government, of course, made no such actual provision. For the accumulation of actual physical capital assets based on decades of private saving and investment, that in a free economy would have been the source of future financial security, it substituted its promise to levy taxes on future generations, while it consumed the funds that should have gone into saving and investment and a resulting accumulation of capital assets. It must be realized that this lost private saving and investment and its corresponding accumulation of capital assets was essential just to maintain the stock of capital assets, let alone increase it. This is because in old age and retirement, people consume the wealth they have accumulated to provide for that period of their lives. If the generations following them are not engaged in making their own, fresh provision for old age and retirement, the consumption of a current generation of the elderly serves to deplete the overall stock of capital assets in the economic system. From its inception in 1935 to the present day, the Social Security system, reinforced by Medicare since 1965, has served both to undercut people’s motivation to provide for old age and retirement by means of saving and also, as the taxes to finance these programs have increased, their sheer ability to do so. Thus more and more of the savings and capital assets accumulated in the past have been lost. One can see the effects of this decumulation in the withering of the industrial base of the United States and in the accompanying dramatic decline of formerly major centers of production, such as Detroit, Cleveland, and St. Louis. The wealth that was once present there has disappeared, sucked up into the voracious consumption of the government, under the leadership of ignorant, dishonest, and vicious politicians and officials. Of course, the customary explanation of the decline in America’s industrial base is the competition of foreign producers paying lower wages. However, the truth is that if American producers had had more capital, they would have been able to produce more efficiently and at lower costs, thereby more frequently offsetting the advantages foreign producers had by virtue of being able to pay lower wages. Indeed, for generations, American producers had been able to do this. Their superiority in terms of capital invested per worker enabled them to offset even enormous differences between American and foreign wage rates through the higher productivity of American workers resulting from greater capital investment. True enough, foreign investment and the international movement of capital have become much easier since the second half of the last century than it was in the first half. But investing in foreign countries does not reduce the capital invested in the countries in which the investors reside. To the contrary, it increases that capital. This is because the investment greatly increases the productivity of labor and the total of what is produced in the foreign countries, and a major portion of that additional production is capital goods that are exported to the country of the investors. Just as investment in the western states of the United States by citizens of the country’s eastern states served to increase the wealth present in the eastern states, on the foundation of goods received from the western states, so too investment by American citizens as a whole in places like Japan and China serve to increase the capital goods in the United States as a whole, by virtue of the capital goods coming into it from Japan and China. These capital goods can be seen not only in masses of foreign-made components and parts used by American producers, but also in numerous factories, such as the automobile plants built by Japanese and Korean firms in the United States. The influx of foreign capital can also be seen in the fact that it is that foreign capital that largely finances the budget deficits of our spendthrift government and prevents those deficits from consuming still more of the previously accumulated capital of the United States. Thus, the cause of America’s industrial decline is not investment outside the country. Nor, of course, is it exclusively the result of Social Security and Medicare and the decline in saving and investment that they in particular have caused. The elimination of Medicare, especially after age 70, requires that steps be taken to make medical care for the elderly affordable outside of Medicare (and outside of most private medical insurance plans as well). This requires eliminating as far as possible all of the government intervention that over the generations has been responsible for increasing the cost of medical care. In my essay “The Real Right to Medical Care Versus Socialized Medicine,” I present a detailed explanation of the various ways in which government intervention has been responsible for the rise in the cost of privately provided medical care and a program of pro-free-market reform that would dramatically reduce the cost of such medical care and make it affordable for the most part to people without medical insurance. Though written in 1994, in order to help prevent enactment of the so-called Clinton Plan, its findings are as applicable today as they were then, and should be considered as an essential part of my proposals for eliminating Social Security/Medicare. The only significant details that would need to be changed are the replacement of the absurdly and unnecessarily high costs of privately provided medical care in 1994, reflecting all of the government intervention in medical care up to that time, with the still far more absurdly and unnecessarily high costs of privately provided medical care today, which incorporate the effect of the massive inflation of the money supply that has taken place in the intervening years. An important feature of the program of reform that I have presented is that it need not be accepted in toto. Its advocacy of a rise in the Social Security/Medicare retirement age to 70, and even to 75, could be accepted by those who wished to retain these programs but limit them to an older population than is the case at present. The enactment of either of these limitations would be an important victory. One that would take nothing away from the goal of the ultimate total elimination of Social Security and Medicare and would serve as an important step on the way to the achievement of that goal. This program will undoubtedly seem much too slow for some supporters of individual rights and freedom. Nevertheless, I believe that it is in fact the most rapid means of achieving its ultimate goal that does not entail a revolutionary overthrow of what have come to be established rights in the law, however wrong-headed the law has been in establishing those rights in the first place. Proceeding in this way is an essential aspect of Liberalism in its classical sense. Fundamentally, rights to entitlements of any kind, that must be paid for involuntarily by other people, are no more legitimate than the alleged property rights of slave owners in their slaves. Yet to avoid civil war, Liberalism would have urged a policy of compensated emancipation rather than one of violent emancipation. Today, in fundamentally similar circumstances, Liberalism must limit as far as possible the disturbance that would otherwise be caused by the elimination of illegitimate, perverted rights. At the most fundamental level, what this discussion of reform serves to bring out is the conflict between the philosophies of individualism and collectivism. Social Security and Medicare are monuments to collectivism. Both rest on the premise that the individual cannot make his own provision for old age by means of saving and that instead he must rely on that great collective, Organized Society, i.e., the Government, to make provision for him. The individual, of course, is the party with by far the greatest interest, indeed, the only really powerful, life-or-death interest, in providing for his old age. The rest of the world can never experience the matter with the intensity with which he will one day experience it if he lives to old age, nor with the intensity that he would experience it relatively early in life if he were accustomed to think clearly about the future. Many individuals, of course, do not think about the future, or not sufficiently about it. But many in this category, perhaps the great majority of them, would do so if they lived in conditions in which they were familiar with the suffering of others that resulted from bad choices and were not protected from themselves suffering the consequences of their own bad choices. In any event, it cannot be that a solution for any presumed inadequacies of the individual lies in removing his responsibility for providing for his future and placing that responsibility instead in the hands of a mass of other individuals. For those other individuals must be presumed to be not only equally incompetent, but they also lack the motivation of self-preservation that each individual experiences in matters of his own life and well being. Indeed, the notion that the alleged incompetence of the individual is a basis for turning responsibility over to the collective reduces to the absurdity that those who are incompetent to run their own lives, in which everything is at stake for them, are thereby qualified to run the lives of others, in which virtually nothing is at stake for them. The consequences of enacting this absurdity are not only economic destruction through the undermining of saving but also the potential for nothing less than a virtual geriatric holocaust. That will be the result when masses of elderly people, without means of their own and dependent instead on the support of masses of anonymous strangers, wake up to find that the strangers have grown tired of supporting them. With government control of medical care and what is considered proper medical protocol in the treatment of diseases, even those who have managed to provide for their own future are at risk. Despite their endless posturing and pretense, politicians do not love the masses—of any age. What they love is their own power. They pretend to love the masses as a vehicle for gaining power. History shows again and again that once they gain it, the lives of millions become expendable. The actual fact is that while the lives of the elderly are of inestimable value, when taken one at a time, to the individual elderly person concerned, they are of no actual value to politicians and government officials. Indeed, from the perspective of the self-interest of all-powerful officials, contemplating the land and the people of their country as their personal possessions, existing for no purpose other than their—the officials’—glorification, the existence of the elderly stands as an actual impediment. For the elderly consume substantial amounts of the resources of the collective that the officials control, and at the same time they produce little or nothing, and no longer have any prospect of ever doing so. If they ceased to exist, the officials would have resources available to put to other uses that they would certainly judge to be more important. Today, of course, the elderly still have the vote, and that may protect them for a time. But all-powerful government is clearly the direction in which we are moving. We are placing ourselves more and more in the power of government officials who regard us the way a farmer regards his livestock. We will be able to live, in poverty and as slaves, so long as we are useful to them. But when we are too old to be useful to them, we will be left to die. As the Times’ article referenced above put it, we will then be spoken of in terms of such euphemisms as having “chosen `medical management without dialysis,’” i.e., “medical management” without treatment. If we want to protect the value of individual human life, particularly in old age, when it is most vulnerable, we must reverse direction and start dismantling Social Security and Medicare, two potentially deadly collectivist institutions. We must restore to the individual the responsibility and the power to determine his own future through forethought and saving. The individual must have his own individual property with the freedom to use it for his own well-being, as he sees fit. Government officials must be barred from the process. * Copyright © 2011 by George Reisman. This article is a revised and expanded treatment of the subject that appears on pp. 976-77 of the author’s Capitalism: A Treatise on Economics (Ottawa, Illinois: Jameson Books, 1996). George Reisman, Ph.D. is Pepperdine University Professor Emeritus of Economics and a Senior Fellow at the Goldwater Institute. His website is www.capitalism.net. 1. In fiscal year 2012, expenditures for Social Security are projected to be $761 billion, while those for Medicare are projected to be $468 billion. Total federal government spending in 2012 is projected to be $3,699 billion. Source: Fiscal Year 2012, Budget of the U.S. Government Washington, D. C.: U.S. Government Printing Office, 2011), p. 174 (Table S-3). 3. Source: Annual Statistical Supplement to the Social Security Bulletin, 2010, p. 228 (Table 5.A1.1). 4. See Medpac, June 2010 A Data Book, Healthcare Spending and the Medicare Program, p. 34 (Chart 2-2. Medicare enrollment and spending by age-group, 2006). This chart shows that almost 31 percent of Medicare’s spending is on account of the age-group 65-74. At the same time, Social Security Data show that the 65-69 subgroup accounts for 55 percent of the larger age-group. The larger proportion of people in the younger subgroup offsets to an important extent the higher per capita medical expenses of the older subgroup and suggests the possibility of the degree of cost reduction indicated. 5. See Medpac, ibid., p. 33 (Chart 2-1). 6. See Annual Statistical Supplement to the Social Security Bulletin, 2010, p. 1. 7. For elaboration of this last point, see “The Undermining of Capital Accumulation and Real Wages by Government Intervention,” pp. 636-39 of the author’s Capitalism: A Treatise on Economics (Ottawa, Illinois: Jameson Books, 1996).